Australian fashion designer Kirrily Johnston has unexpectedly teamed up with Kellogg's Special K cereal for a limited edition handbag. 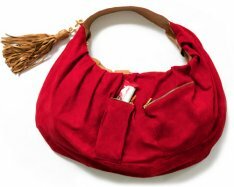 The classic red suede hobo features a clever pocket purpose built for holding a Special K cereal snack bar. According to the press release this pocket serves as "a visual cue to help the 96% of women who think about snacking each day to prepare for their looming snack attack." That sounds like a bit of a beat up, which is surprising since the bags won't actually be sold to the public. Instead the 50 bags will be distributed to winners of a Special K competition. If we believe the official line, let's just hope some of that 96% of the population win one of the purses! With each suede hobo valued at $750, it’s surprising to see Kirrily Johnston being so generous with the design. But it sounds like a great way for Kellogg's to promote those snack bars. It's the first time the company's looked outside television to launch a new product, and if this campaign goes well it probably won't be the last! The limited edition bag is part of Kirrily Johnston's spring/summer collection, which makes its debut at Sydney's Mercedes Benz Fashion Week this week.